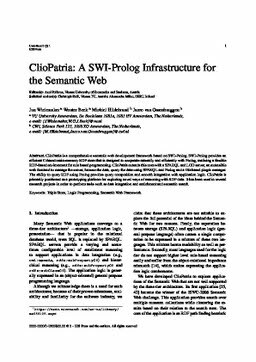 ClioPatria is a comprehensive semantic web development framework based on SWI-Prolog. SWI-Prolog provides an efficient C-based main-memory RDF store that is designed to cooperate naturally and efficiently with Prolog, realizing a flexible RDF-based environment for rule based programming. ClioPatria extends this core with a SPARQL and LOD server, an extensible web frontend to manage the server, browse the data, query the data using SPARQL and Prolog and a Git-based plugin manager. The ability to query RDF using Prolog provides query composition and smooth integration with application logic. ClioPatria is primarily positioned as a prototyping platform for exploring novel ways of reasoning with RDF data. It has been used in several research projects in order to perform tasks such as data integration and enrichment and semantic search.